The big challenge that Operations Management are faced with is “how to keep or improve overall efficiency and throughput when producing 100 instead of 10 stock-keeping units (SKUs), which probably consist of 200 instead of 50 raw materials?” Lean philosophy, which was introduced to car manufacturing and other industries decades ago, plays an important role but innovative and modern technology is just as important. 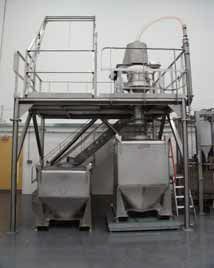 Most powder processors get involved with at least 3 process steps, namely Formulation, Mixing &amp; Packing. This applies to both Business to Business (B2B) and producers of Fast Moving Consumer Goods (FMCG). 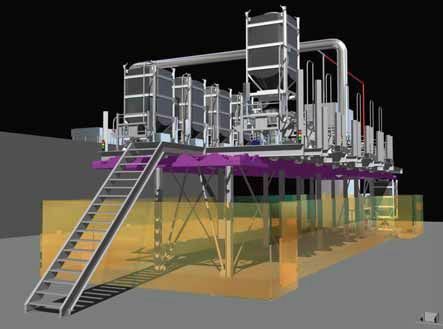 It is common to find a number of bulk and day silos combined with an array of pneumatic conveying lines in traditional high throughput plants. 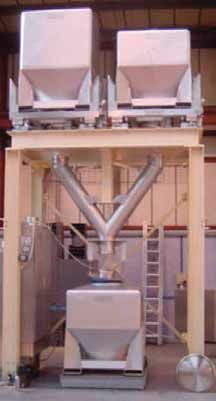 This design caters for highest possible levels of automation and theoretical lowest cost per Kg processed. Such an approach however is declining in relevance and popularity as flexibility simply cannot be achieved. Easy to clean design to allow quick recipe changeover. Whilst a totally manual approach is the most cost effective solution for smaller operations; there are clearly merits in considering some form of automation to cope with higher throughput. This is especially true for multi-shift operations where man power cost is multiplied by the number of shifts. How and what to automate in order to achieve best possible payback is a very complex challenge. Most operations look purely at volume consumed of various raw materials and a decision to automate is based on volume only. However, it is of almost equal importance to review the frequency of usage of each raw material. Consideration should also be given to smaller hand weighments, which are time consuming and costly, and may therefore be relevant to automate. For operations that have a very wide variety of recipes and raw materials, it is quite common that an IBC based Formulation System proves most cost and space effective after a more thorough review. 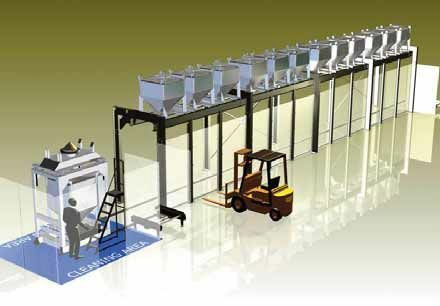 Unlike a system with fixed hoppers and dosing direct from big bags, it is very quick and easy to change from one raw material IBC to another, with minimal or even no down time, subject to system design. Matcon supply Cone Valve IBCs which offer the benefit of dosing directly from the IBC – without the need for a secondary feeder. even more is theoretically possible. We are witnessing a definite trend for these systems. Independent to what Formulation System is chosen, in all instances, it is beneficial to keep the number of mixers to a minimum – by optimising Overall Equipment Effectiveness (OEE) for each mixer. This is traditionally done by applying campaign manufacture – which is not at all desirable from a ‘Lean’ perspective as it creates unsold inventory. It is more beneficial to employ mixers which are easy to clean, or do not need any cleaning at all, like the IBC mixer. At the heart of the system, reliable, IBC in-bin blending means that recipe changeover is instantaneous as product is mixed within the IBC itself and does not come into contact with the Blender. In fact, a number of different recipes can run at the same time without risk of cross-contamination of allergens as the system remains closed at all stages. Many food processors are pre-mixing small and specialty ingredients, generally speaking to achieve an adequate homogeneity (quality) of the final blend – a necessary evil. It is often overlooked that pre-mixing can be positively employed to gain tremendous efficiency within the area of recipe formulation. If the same recipe shall be produced in 10 consecutive batches and there are 10 small ingredients (for example), then a premix can save the processor 80 weighing operations (or 90 in the case of automated dosing of the pre-mix). 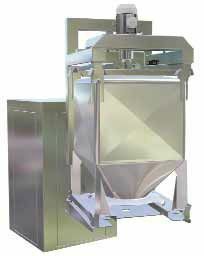 the filling and packing equipment is quick &amp; efficient with change-out parts available to make cleaning even quicker. Decoupling and using IBCs is all very well in theory, but sometimes more difficult in practice if the right IBC is not selected. Failures have included excessive dust, poor control of flow and segregation. However, with Matcon IBCs, the unique cone valve technology within each one both promotes mass-flow, protecting against segregation and preventing bridging and blocking. In conjunction with the Matcon Discharge Station all feeding to down-stream processes can be undertaken in a controlled, automated manner ensuring a continuous feed allowing this equipment to work effectively and maximise throughput. New Pharmaceutical Business Line Director appointed at Matcon Ltd.